The World's Most Accurate GPS Navigator! Leica's revolutionary MX480 professional chart navigation system combines the ultimate in accuracy and graphics. 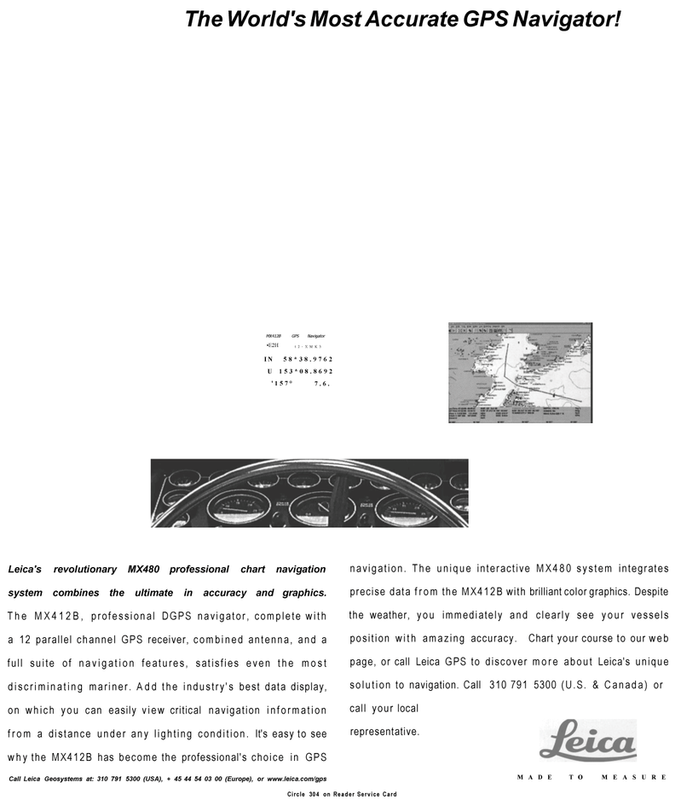 Call Leica Geosystems at: 310 791 5300 (USA), + 45 44 54 03 00 (Europe), or www.leica.com/gps navigation. The unique interactive MX480 system integrates precise data from the MX412B with brilliant color graphics. Despite the weather, you immediately and clearly see your vessels position with amazing accuracy. Chart your course to our web page, or call Leica GPS to discover more about Leica's unique solution to navigation. Call 310 791 5300 (U.S. & Canada) or call your local representative.